World of Warcraft is an online compute game that allows millions of players world-wide to adopt an alternate identity, playing as any number of fantasy-themed races that exist within the confines of the fictional world of Azeroth. And now, we offer you the opportunity to take that creation out of the game. Offering a number of licensed masks and items that are modeled after actual items and appearances from within the World of Warcraft, these products are fantastic for starting, or finishing, your very own World of Warcraft costume. If you want to be a night elf or a blood elf, we offer the kits to apply your own elongated ears. And we offer masks that feature the likeness of several of the more common races within the World of Warcraft, including taurens, goblins, orcs, draenei, and the undead. We even offer a few masks dedicated to specific individuals, like the Mr. T Mohawk and Illidanas well as an oddly adorable murloc that you can wear on your head. And since we are an equal opportunity trader, it doesn't matter if you're Horde of Alliance: if you love World of Warcraft and you need a mask for costumes or just for fun and collection then here is the place to get them. Our Orc Deluxe Latex Mask with Beard is licensed from the popular game World of Warcraft. 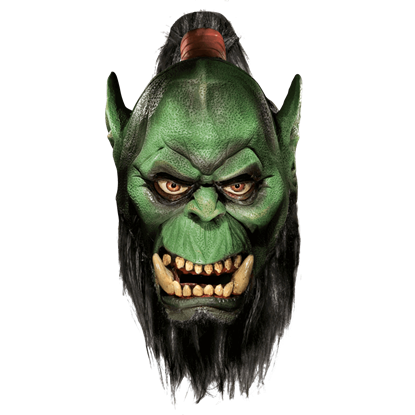 This Orc Deluxe Latex Mask with Beard will make you look and feel just like an Orc! The Orc Deluxe Latex Mask with Beard comes as it is shown. 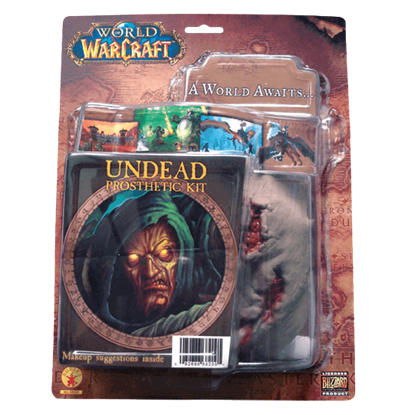 Our Undead Prosthetic Kit is licensed from the game World of Warcraft. The Undead Prosthetic Kit includes a latex jaw prosthetic, spirit gum and remover, 4 color make-up palette, washable white cream make-up, and a sponge applicator.